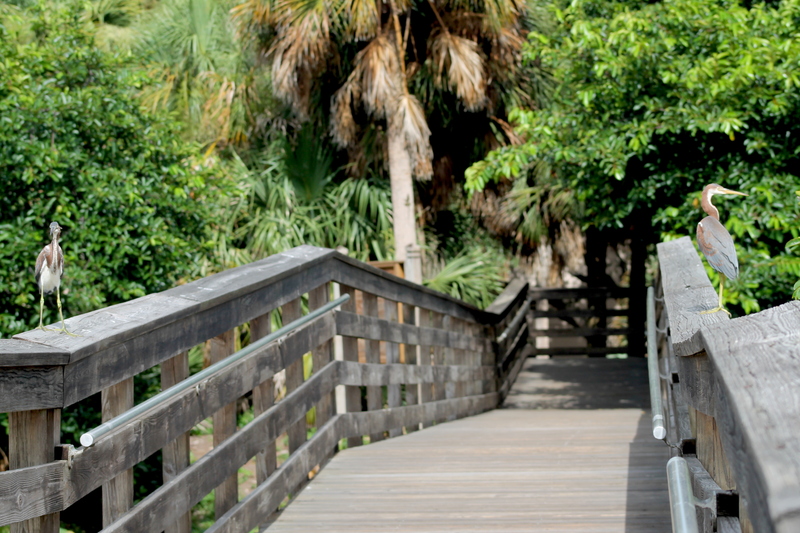 In suburban West Delray, there is a hidden oasis that will truly delight any bird- or nature-lover. Wakodahatchee Wetlands is a tranquil, man-made wetland that has naturally become a sanctuary for over 140 species of birds, as well as a variety of amphibious and reptilian species. The first time I arrived at Wakodahatchee Wetlands, I was awe-struck by the cacophony of bird calls, and the diversity of birds all in one location. I have never been to any other natural setting where there were so many different types of birds that I could easily observe in their natural environment. There were birds nesting, floating, and soaring in every direction! It was a cinematic moment. 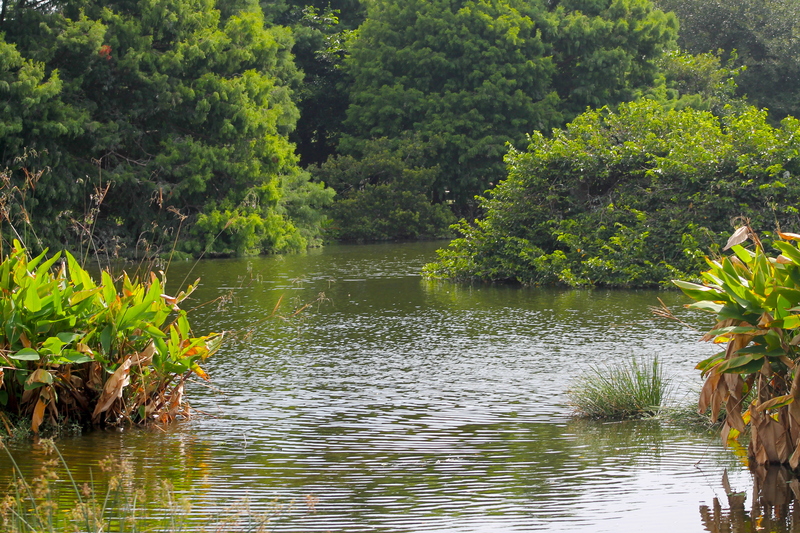 Using over 50 acres of utilities land, the Palm Beach County Water Utilities Southern Regional Water Reclamation pumps nearly two million gallons of highly treated wastewater into the Wakodahatchee Wetlands. Instead of this land just being a nasty wastewater pond, or the wastewater instead being harmfully pumped into the ocean or injected into the ground, Palm Beach County (PBC) has found a way to harmonize with the natural environment. Instead of causing greater destruction, PBC has instead enhanced the lives of many birds who have lost their homes to the suburbs and development of the area. Wakodahatchee Wetlands is a great example of how modern society can coexist with the natural world, and I think it is a place that other municipalities throughout the state of Florida and the US should tour to see how this man-made ecosystem is thriving. Directions: The Wakodahatchee Wetlands are located on the east side of Jog Road between Woolbright Road and Atlantic Avenue (Exit Route 95 onto Atlantic Avenue West; continue to Jog Road; turn right; park is on the right) The site is on the southeast side of Palm Beach County Water Utility Department’s Southern Region Operations Center at 13026 Jog Road, Delray Beach. *Tip*Go early in the morning when the birds are waking up and becoming active, and before the sun gets too hot. There are covered pavilions with sitting areas along the 3/4 mile boardwalk just in case. What to bring: Bring a hat, sunscreen if you have sensitive skin, and definitely a bottle of water in a reusable container. There are covered seating areas if you need a respite from the sun on the walk, but most of the boardwalk is exposed. There is not really a place for picnicking, and it is best to bring as little with you as possible to reduce litter in this beautiful habitat. The Wakodahatchee Wetlands welcoming committee. Looking out at the Wakodahatchee. 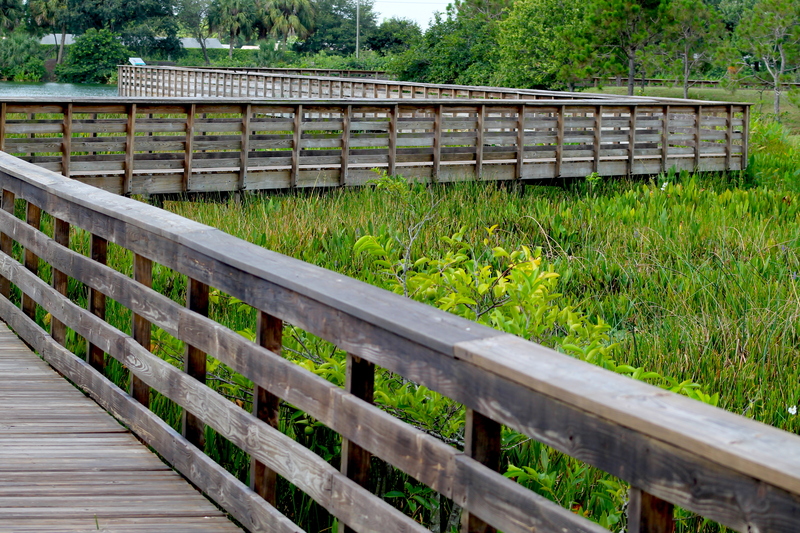 Follow a raised boardwalk for most of the journey through the wetlands.